Book Synopsis: This is the fifth book in the Rowland Sinclair series, eagerly awaited by me and yet again a book I found difficult to put down. I have followed Roland Sinclair and his friends, Edna, the sculptress, Milton, the poet and Clyde, another artist, since the beginning, but I must stress that it is not necessary to go back to the beginning as each book is very self-contained. There are a number of things I love about The Rowland Sinclair series. Sulari Gentill graduated in law and gave up her legal career to write novels. Her background is probably the reason that she is such a great researcher, a fact that is obvious in her books. At the beginning of each chapter is an extract from an Australian newspaper and then the content of the newspaper article is linked to the chapter in some way. It is an excellent refresher course in what was happening in Australia between the Wars, and how Australia was impacted by what was happening in Europe, in particular the rise of Nazism and the reaction of the UK to the rise of Hitler. However, this is all done in the context of a riveting story with many threads woven through it. Rowland, with Edna, Milton and Clyde, had gone to Germany at the encouragement of Roland’s brother, Wilfred, to deter Eric Campbell, the commander-in-chief of the Australian New Guard, from meeting Hitler and offering the Australian New Guards support to Hitler’s aims. This book begins in Paris. Roland and his friends narrowly escaped Germany with their lives and now they are heading home. However, Paris is not far enough from Germany and their Nazi pursuers’ and they have another narrow escape on the morning that they are due to leave for London. Safely in London, Roland wants to warn the British politicians about what is happening in Germany. It is whilst on this quest that the adventure begins. Wilfred has arranged a meeting at the exclusive Watts Club for Roland to meet with Lord Pierrepont, a politician who may be able to assist Roland to expose Hitler’s actions. 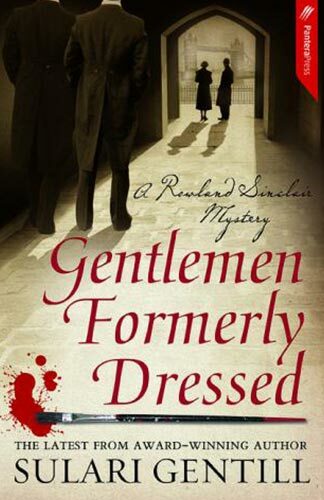 When Rowland arrives Lord Pierrepont is dead, a knife in his chest and wearing a woman’s nightdress. His niece, Allie Dawe, is standing over him, with blood on her hands, screaming. The police attend and eventually Allie is arrested for Pierrepont’s murder but Rowland is not convinced that she did it. Rowland and his friends then start their own investigation, which makes some people very unhappy. It appears that they want the whole thing covered up, even if an innocent woman hangs for a murder she didn’t commit. What unfolds is a trip to Madame Tussauds where they leave with a wax head of Lord Pierrepont for return to his widow, or is she? Rowland attends a sitting of the British parliament, meets H G Wells, a font of information, and gets into a scuffle with members of Moseley’s Fascist group who are then arrested, and of course this behaviour incurs the wrath of Wilfred, his brother, yet again. What then unfolds is Rowland being a target of Moseley’s group, whilst several people trying to stop his investigation into Lord Pierrepont’s death, including his British uncle who works in the intelligence service. However, Roland will not be deterred so he is kidnapped, beaten and saved from death by unlikely heroes. There are so many twists and turns in this story and nothing is as it appears to be, but that’s what makes it a page-turner. The story is rich with threads and characters, and often when the thread is followed to the end, you will find yourself saying, ‘Wow, I didn’t see that coming’. Woven through the story are encounters with well-known people such as H G Wells, Churchill, Stanley Bruce, Prince George, Wallis Simpson and many other significant people of the time. I have enjoyed every book in this series but I believe that this one is the best yet. Every word fulfils a purpose, so the writing is tight, the plots believable and their solution unpredictable. A great read.